*I’m participating in my very first Tuesday Trainer hosted by Lindsay of Lindsay’s List. This week’s workout is Heart Rate Boosters! My contribution was Lateral Box jumps. She puts together a whole workout filled with videos (from some amazing bloggers) to show you each move. Click here to check it out! Or click the button below to see all the past Tuesday Trainer’s for some great new workouts! Today I have a fun little guest post to share with you from one of my newest Twitter friends! Amy has an adorable blog and an even more adorable little baby. Check out this recipe that’s packed with flavor and can easily be made for meat-eaters as well as vegetarians. Amy’s pretty new to blogging but is already doing amazing things, so be sure to leave her some love and head over to check out her blog! My name is Amy and I live in Charleston, SC with my husband, 9 month old baby boy, and retired rescue greyhound – Lily! I’m the girl behind the new blog Sixth of April. Why is the Sixth of April so worthy of a blog name, you ask? Well my son Ryan was born on that day! My blog is a crazy mixture of food, fitness, books, and my adventures as a first time mama. Please stop by and say hello or find me on twitter at mangomoon7! 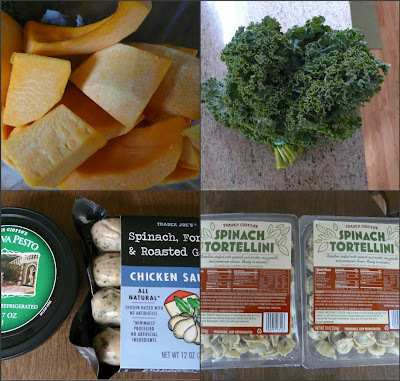 Lindsay was nice enough to let me share with you one of my new favorite recipes that I created one day when I was starving and in a hurry (that seems to happen to me a lot) – Spinach Tortellini with Kale, Sausage, and Butternut Squash tossed with pesto. Whew.. what a name! You will be quite surprised at how easy this recipe is. In fact, I’m almost embarrassed to even call it a recipe. It’s more like ‘throw some awesome stuff in a pot and mix’. Get ready to wipe that drool off your face because this is a good one – especially if you are a pesto and kale lover like I am. – 2 packs of spinach tortellini (regular tortellini would be just as delicious or even just a plain pasta might work too!) I use 2 packs for…. LEFTOVERS! Meanwhile, place 3 sausage links on grill pan and cook until they appear brownish. The Trader Joe’s sausages are fully cooked so you just need to heat these up! Simple, right? Again, if you are a vegetarian, just eliminate these and try adding a bean for extra protein. Well hello! Look who crawled in! … and now look who is trying to open all drawers in the kitchen. In case you are wondering, I did in fact finish making this recipe with one knee held up against the drawers. Once the sausage is browned, remove casing and cut up into 1/4 inch rounds. Throw them on top of tortellini and then add your pesto (I use just about the entire Trader Joe’s container) and mix it all up! How easy was that? Not only is this dish delicious but it also makes a wonderful dinner party dish. It’s always a hit over here and I hope you all enjoy it! Thanks Amy!! I’m a huge pesto lover and will definitely be giving this a try with some chickpeas. Yummmmmmmmm. Put together a terrible 2’s workout. Wanted something that would pass quickly and be done quickly. The basic idea is you alternate a 2 min fast run with 2 minutes off the treadmill doing as many of an exercise as you can in 2 minutes without compromising good form. This works out to be 20 minutes long, with 2 minutes of rest total . 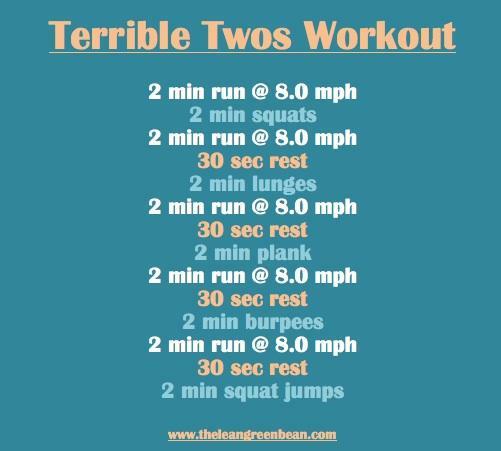 Get it- 22 mins, 2 mins each exercise, Terrible Twos Workout? Clever right?! Write down how many reps you do of each exercise and try to beat that number next time! If you can’t do a two minute plank, hold it as long as you can and then immediately do another that’s long enough to get you to two minutes. I covered 1.26 miles on the treadmill. Loved this workout! Flew by and really got me sweating. I did 56 squats, 60 lunges, 38 burpeees and 45 squat jump-ups. I probably could have done more squats but I wanted to go at a speed where I could keep going steadily for the whole two minutes. -Make sure you choose a running speed that is challenging for you. 8.0 mph is the fastest I usually run on the treadmill so it was VERY challenging for me to run at this speed for 2 whole minutes. -If you’re not tired enough to need the 30 second breaks after running, you’re running fast enough! -For the squat jump ups, you can use a box/exercise step/or your imagination. Stand with your feet on either side of your box/step, squat down and then jump up on to it with both feet. Step down on either side and repeat. I definitely need more heart rate boosters – can’t wait to check this out. This recipe looks awesome too. Thanks for introducing us to Amy! Whoop! Looks so yum! I’m coming over for dinner! I love recipes that are simply and delicious – this one sounds great! What a beautiful tortellini dish loaded with veggies and chicken!! Mmm thanks for the great meal idea! looks so good. I love those sausages. I SO wish I had a TJ’s near me! There is a relatively good vegan grain sausage out there. I’ve only had the chipotle flavored one, but they have others, and I was pleasantly surprised that it didn’t completely gross me out, but actually was kind of good. This looks delish, of course. Why doesn’t Alaska have Trader Joes yet? If we had one, I would assuredly never leave this state! those workouts are the best, simple yet productive. and WOW< sore!